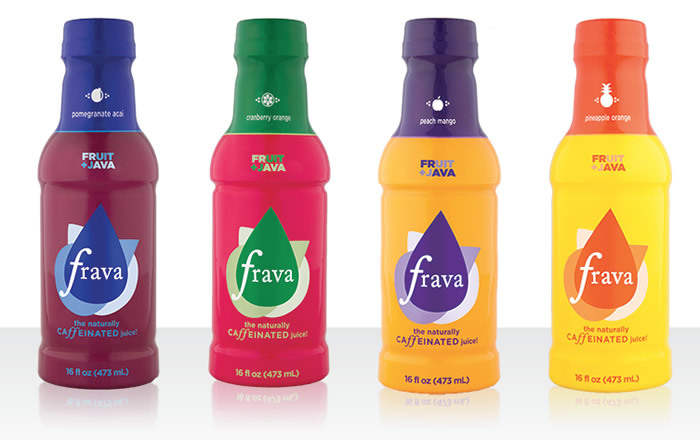 Frava Caffeinated Juice is a unique beverage that combines 40% fruit juice with the natural caffeine in green coffee. This drink is marketed to those who like the lift caffeine offers, but who aren't fans of coffee and/or energy drinks. Frava recently sent us some samples of each flavor to try out. I think the first thing that stood out to me was the caffeine content of Frava. 100mg per serving or 200mg per 16 fl.oz. bottle rivals most energy drinks on the market and is comparable to a large cup of coffee. 40% juice is impressive, but with all 4 flavors apple juice is the second or third ingredient behind water, yet none of the juices are labeled as apple flavored. However, I understand that apple juice is often used as a base for beverages and it compliments other juice flavors well. Cranberry Orange: This flavor is delicious and definitely my favorite. Great orange flavor with a touch of cranberry and the perfect amount of sweetness. Pineapple Orange: I'm not a huge pineapple juice fan, so this didn't do it for me. But, those that like pineapple will enjoy it. Peach Mango: My second favorite of the four and had a nice blend of flavors with not being overly sweet like some juices tend to be. Pomegranate Acai: Acai flavored beverages are a bit of a mystery because I'm not sure what acai is supposed to taste like. I've never had pure acai juice and most drinks, including Frava, combine it with other juice flavors. I can taste the pomegranate for sure, but beyond that it seems apple flavored. It tastes good, but with acai being the last ingredient there probably isn't much in there. I love the fact that Frava is 40% juice and that the caffeine is derived naturally from green coffee beans. I also like the fact that all four flavors only have 20 grams of sugar per bottle as I tend to stay away from sugary drinks. All four flavors are enhanced with Sucralose and Ace-k to increase sweetness, which does cut down on the need for extra sugar. However, since Frava is aiming for a more natural product, it would have been nice to have seen Stevia and/or a sugar alcohol used instead of artificial sweeteners. Frava Caffeinated Juice delivers in the energy department for sure. Because I had to sample all four flavors for this review, I'm feeling wide awake. In all I've had about a bottle's worth and feel alert, but not jittery. All in all, Frava is a good alternative to coffee and/or energy drinks, so keep your eye out for them in your area. Warning: Frava may be 40% juice and low sugar, but they are not for children. Kids will find these delicious, so keep Frava out of their reach. Sugar content: 20 grams (per 16 ounces). How Does Frava Caffeinated Juice Compare? Frava Caffeinated Juice contains 12.50 mgs of caffeine per fluid ounce (42.27mg/100 ml).